Course is full and we are no longer excepting applications for 2019. Please contact the Department if you would like to apply for 2020. Act now to take advantage of this unique opportunity and get a credit in the process! Description: Come join us and have the experience of your life – touch and interact with dolphins & manatee; all the while getting a University of Toronto and Physiology half credit. Experience real-life physiology of these beautiful and awesome creatures. First week (April 28 - May 5) is spent in Mexico with daily activities such as in-water direct interactions with these amazing animals and out-of-water observations of them as field data collection at a marine mammal facility ideally suited for interactive study of marine mammals in a natural habitat. In addition, there will be an opportunity to swim with them. During the second week in Toronto (May 6-10), in-depth analysis, interpretation, and group discussion of the information collected will form the basis for the final report. Space is limited for this unique one of a kind opportunity and it is filling up fast. Cost: Approx. $3,300 USD (includes accommodations, food, and all course materials). Students are responsible for airfare and any applicable university tuition. Contact: Dr Wittnich immediately at c.wittnich@utoronto.ca to be sure not to miss this experience! To Register: Please fill out the Course Application Form with a $500 CDN non-refundable deposit payable to the University of Toronto and submit to Eva Eng, Medical Sciences Building, room 3209. *Please note that the course fee (approx. $3,300 USD) includes accommodations, food, and all course materials. Students are responsible for airfare and any applicable university tuition. Summer 2018 Training Activities in the Department of Physiology: Never a dull moment. Unique Physiology field course gives students hands on comparative physiology opportunity in Riviera Maya, Mexico. Every year for the past 8 years, after final exams in April, an enthusiastic group of undergraduate students participate in a very unique field course opportunity offered by the Department of Physiology (PSL 379) to see first-hand the importance of physiology to how various species adapt to their environment and get a half credit in the process. This is co-ordinated through the Oceanographic Environmental Research Society, who provides all the logistics for this opportunity. 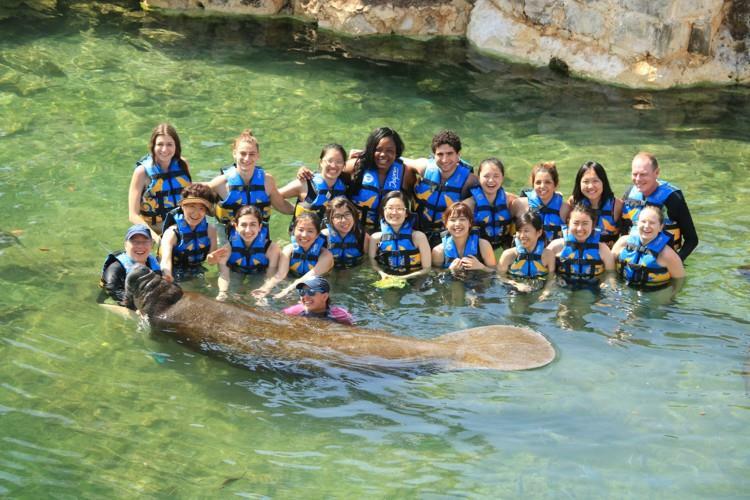 The location is in the most beautiful of settings in the Riviera Maya, a nature reserve in Mexico, where the students spend time having personal interactions with a variety of marine mammal species, including sea lions, manatee and dolphins. Students not only conduct their own physiology-based research but also get to spend time in the water with these amazing creatures and come away with a new found appreciation of how the facts learned in the classroom have relevance to daily life! In early May 2018, we hosted the largest class ever, with 22 University of Toronto students from diverse backgrounds including physiology specialists as well as those from Human Biology and other departments within the Faculty of Arts and Science participating. Everyone took advantage of all this course has to offer and overcame their worries about being in the water with these large yet gentle creatures and it was hard to tell who was having more fun, the animals or the students. This is learning at its best both experiential and applied.